Coconut oil is often praised as a massage oil that can soothe the skin. It can also effectively treat dry skin, eradicating skin flaking. Coconut oil contains high amounts of vitamin E that can help the skin clear blockages while diminishing skin infections such as acne, dermatitis, eczema or psoriasis. This ingredient can also be used to prevent skin sagging and wrinkling so coconut oil is commonly found in creams, lotions and soaps. Using coconut oil for face can give you a smooth and glowing face. 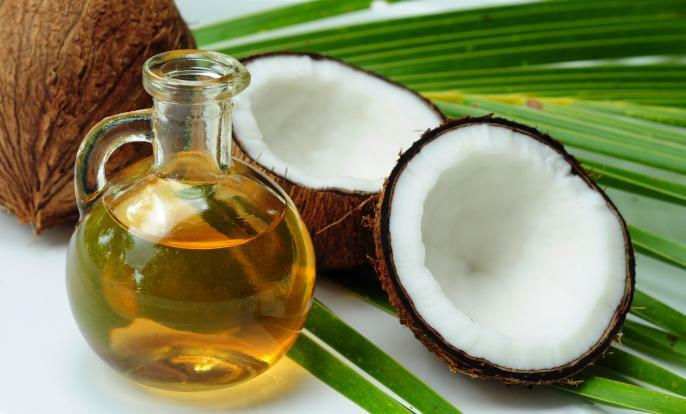 Throughout this article we will introduce how to use coconut oil for face. Fight Skin Infection. Coconut oil has antibacterial properties which can help to clear away infections, acne or eczema breakouts on the skin. Protect against the Sun. Coconut oil has approximately SPF 4 protection that has been utilized for centuries to protect the skin from the sun. Because of this coconut oil is frequently included in products such as tanning lotion or sunscreen. Moisturize. The natural essential fatty acids in coconut oil helps to lock in the skin's moisture to help maintain healthy moisture levels. Provide Vitamins and Minerals. The natural fatty acids in coconut oil also contain high amounts of essential vitamins and minerals. As the oil is absorbed into the skin these ingredients will be replenished as necessary. Absorb Quickly. Unlike some similar products, coconut oil is absorbed quickly so it will not leave a greasy feeling after it has been applied. To begin with, it's important to know that you should avoid using coconut oil that has been heat treated. Instead, choose natural and organic coconut oil. One great product would be virgin coconut oil that is cold pressed. This recipe servers not only as an excellent moisturizer but can also exfoliate your skin. Materials: A tablespoon of honey, a tablespoon of coconut oil, a teaspoon of demerara sugar or brown sugar, ½ teaspoon salt. Instructions: Combine all ingredients and apply the scrub to the skin in a circular motion. Leave the scrub in place for a few minutes to moisturize the skin then gently rinse the scrub away and pat the skin dry. This recipe is very soothing and calming, while the antibacterial property can fight off the acnes and eliminate acne scars on your face. Instructions: Combine all desired ingredients and apply to the skin the way you would use your everyday cleanser. Leave the mixture in place for one minute before rinsing it away and patting the skin dry. This recipe is extremely moisturizing and can make normal and dry skin type glow. Instructions: Blend your ingredients and apply to the skin. Leave the mask in place for 10-20 minutes then wash it off. Adding a bit of carrot seed or rosehip oil to your mixture can add anti-aging or moisturizing properties to your mask. This is an excellent remedy for acne blemishes. Instructions: Combine all desired ingredients and freeze the mixture for 15-20 minutes. Use your fingertips or a cotton pad to apply the mask to your skin, leaving it until it dries or as long as you like. This recipe also serves as a nourishing moisturizer for your skin, you can add other essential oil as you like. Instructions: Blend the ingredients together, storing the mixture in a glass bottle. Apply a few drops of the serum to your skin each day. Once you have opened a jar of extra virgin coconut oil, you will need to store it in the refrigerator. Use the oil within 2 months of opening the jar. Store your coconut oil away from direct sunlight. Before using coconut oil for face, test a small amount of the oil on your elbow to ensure you are not allergic to the product. If no rash, irritation or redness appears in the test area throughout the following 24 hours, it is safe to use coconut oil in beauty applications. Coconut oil has antifungal and antiviral properties that help to draw toxins out of the body in its initial use. This might cause the occasional pimple on the skin. Over time these will fade and you will see the results of your treatment.